In 1900 Richard Cooper opened his Watford store here at 61 Queens Rd: Lloyd Cooper and Co. 'The Watford Wheeleries '. Lloyd Cooper and Co were selling the very early Birmingham manufactured New Hudson motorcycles here at Queens Road. New Hudson clipped a 211cc engine to a bicycle and added a three speed hub gear and a multi plate clutch. By 1914 they had a 350cc and a new 770cc, but the war started and New Hudson were obliged to supply models for the war effort. 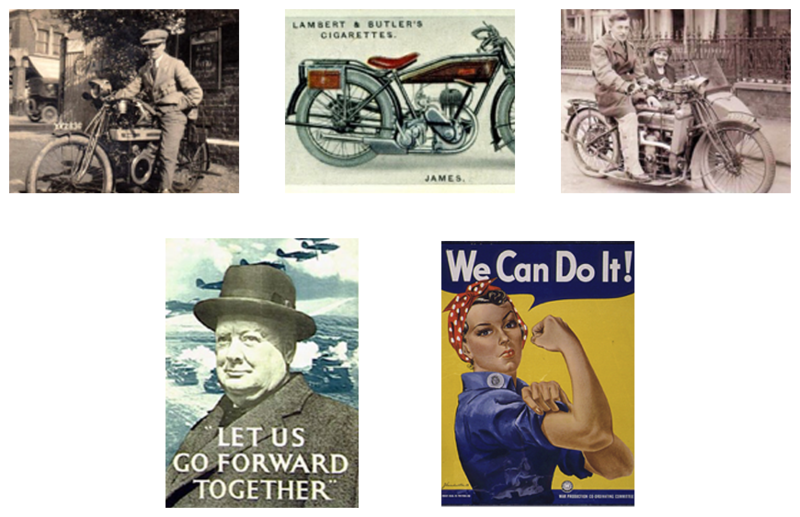 Lloyd Coopers and Motorcycling thrived in this era. Many new brands emerged, boosted by the demands for mass production during the First World War. Richard Cooper was joined by Ernie Dell who went on to manage the shop. They were selling and servicing makes such as Royal Enfield, BSA, James, Francis Barnett and Douglas. Charles Heal joined as a young mechanic but like so many men he left to serve in the Army for the duration of the War. For many this was the Golden Era of British Motorcycling. The demand for motorcycles and motorcycle/sidecar combinations was so high that Lloyd Coopers opened additional premises further down Queens Road in Watford to supply the demand. Ernie Dell and his wife Elizabeth were running the store in a very 'open all hours' sort of way. Boxes of head gaskets, pistons, valves and general engine parts were stored in rooms everywhere. The wood block shop floor became soaked in oil from leaking British bikes [it is still under there today] and Lloyd Coopers became a large BSA and Triumph dealer, along with the likes of AJS, Ariel and Norton (BSA having taken over New Hudson in 1941). The era includes the Mods and Rockers fighting it out in sea side resorts. The Busy Bee Cafe on the A41 in Watford is similar to the famous ACE Café as a transport stop for those heading north. It quickly became the bikers meeting place for the 'Ton up boys ' to have a 'Burn up' racing down the A41 and attempting to get back before the record finished on the Juke Box! 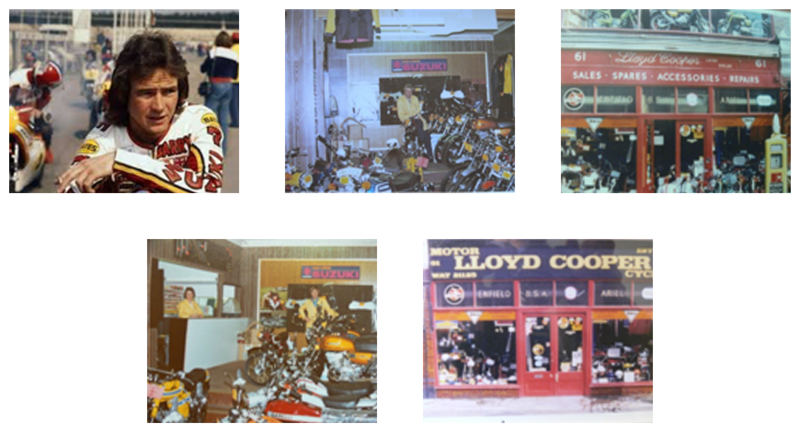 In 1971 Charles Heal took over Lloyd Cooper Motorcycles from Ernie Dell, having worked for him since the late 1930s. The decade sees the end of the British bike and the huge rise of the Japanese manufacturers lead by Honda, Yamaha, Suzuki and Kawasaki. The other brands found in store in the 70s would also include Morini, Batavus, Garelli, Fantic, KTM, Casal and MZ. 16 year old teenagers buzzed around on "Fizzys, AP50s , Garellis , and 'Frantic Fantics' which were sold in huge numbers and introduced a new generation to motorcycling. Despite these 49cc bikes being limited in speed to approximately 45 mph, after a bit of light tuning many lads claimed "My Fizzy does 55mph/60mph/even more!”. At 17 many riders immediately moved up to Yamaha RD200s / 250s , Suzuki GT250s / 380s or one of the many Honda CBs. In the 70s a customer would often walk in to the shop and then ride away on a high performance 250cc bike, having never sat on a motorcycle in their life. There are numerous stories of staff giving kerbside riding lessons and watching helplessly as the new owner stalled, weaved, wobbled or shot off down the road on their new machine! In 1976 Des Gregory joined Lloyd Coopers, working for Charles Heal with his son Gordon Heal. In 1983 Des Gregory and Gordon Heal took over the business from Charles Heal. Lloyd Coopers then became a specialist Honda dealer but that soon changed in 1985 with the addition of Kawasaki and their exciting range of bikes, which included the first so called 'superbike': the Kawasaki GPZ900. With the Kawasaki GT550 and 750 shaft drive models, Lloyd Cooper Motorcycles supplied the large number of couriers delivering all over the UK, and the amazingly reliable Honda C90 proved very popular with commuters and London Taxi drivers 'doing the knowledge'. In the year 2000 James Heal and Luke Gregory joined the company, which also celebrated its 100th anniversary at their original premises in Queens Road, Watford, by winning the Motorcycle News “Dealer of the Year” award. In that same year the company also opened a second store in Hemel Hempstead. In 2009 the original Queens Road shop expands into number 63 next door, becoming the UK's first Kawasaki superstore. And then in 2010 a second Kawasaki dealership was taken over by Lloyd Coopers, making the brand the largest Kawasaki dealers in the UK, and a new exciting era began.